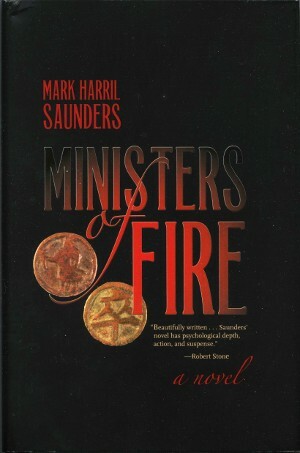 Old Chinese chess piece on cover of "Ministers of Fire"
“Ministers of Fire” is a newly-published critically-acclaimed novel by Mark Harril Saunders which displays an ancient Chinese soldier on its dust jacket. The soldier is not a creation of a graphics designer but is actually an ancient Chinese chess piece dating back about 1000 years. The author contacted me late last year after seeing the old Chinese chess piece on my website. He asked for permission to use the image on the cover of his new novel to be published by Swallow Press (Ohio University Press) in early 2012. I was happy to grant permission and provided the high resolution images. The book is a fast-moving spy thriller which has received outstanding reviews from such notable authors as Robert Stone and John Casey, both of whom are National Book Award winners. The book has also earned a “starred review” from Publishers Weekly. It is quite exciting to see a piece from your own collection on the book jacket of a major novel. I have found your site on Chinese chess very informative and interesting. I am a 3rd yr Student studying a Bachelor of Applied Arts at Northtec New Zealand. I am currently doing a project that looks at the history of chess pieces an their development especially the queen, (that used to be the adviser/general in Indian and Perisian cultures). I would be very grateful if I could use your images of Chinese chess pieces as references for my printmaking assignment and in my art work? Please see my email reply.